On work surface or serving plate, assemble house with 8 cinnamon graham crackers as walls and chocolate frosting as mortar. Frost tops of remaining 4 graham crackers; place on house for roof. Place pumpkin seeds on frosted roof for shingles. Use chocolate frosting to attach licorice pieces to outline house. Use more chocolate frosting to attach shortbread cookie crisps on house for windows. In small bowl, mix white frosting and orange food color. Frost shortbread cookie windows. With small round tip, pipe chocolate frosting for window panes. Pipe RIP on remaining shortbread crisps. 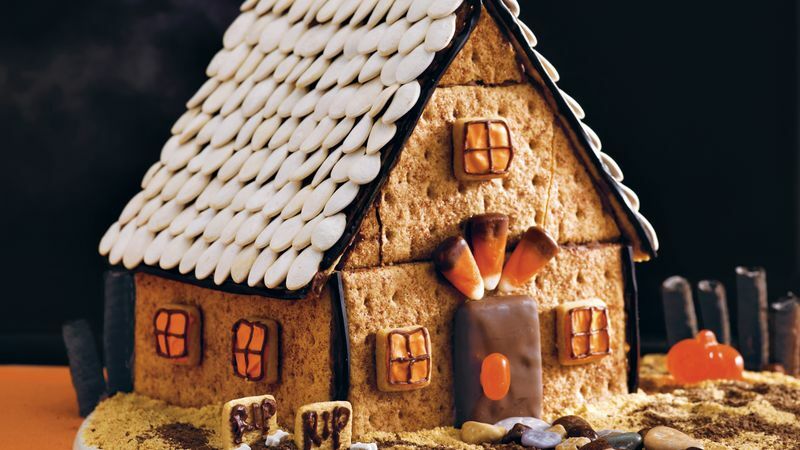 Use chocolate frosting to attach fudge-covered graham cracker to house for door. Use frosting to attach jelly bean for door handle and 3 pieces candy corn above door. Sprinkle plain and chocolate crumbs around house. Place candy rocks in front of house for walkway. Use chocolate frosting to stand RIP shortbread next to house. Use chocolate frosting to stand up chocolate cookie sticks around house for fence. Decorate with candy pumpkins and bone sprinkles. Engage your kids in this Halloween food craft. Display it on the dining table if you dare!